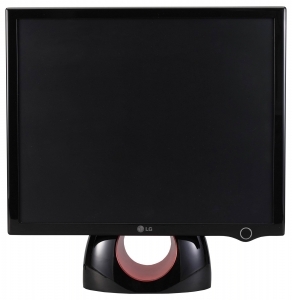 The LG Emotional Series LCD Monitors | OhGizmo! Think the world is full of insensitive jerks and there?s no one to fulfill your emotional needs? Well now you can find solace from an unlikely source: the LG Emotional series LCD monitors. We kid you not, that is what LG has actually termed its latest set of monitors. According to them will it please your aesthetic sense and even fulfill your spiritual needs. Call me a cynic but I highly doubt that it will save me a trip to the rejuvenation centre. Nevertheless, the monitor sure looks great. Extremely sleek and chic, it has a cool black finish with a contrast ratio of 1600:1 and a response time of 4ms. It incorporates a F-Engine for vivid imagery. No word on pricing and availability but it is on display at CeBIT 2006. I don’t see any creativity on the part of the marketing crew at work here. So, is it like a mood ring, changing colors with one’s emotional state? I think that would be pretty interesting, though I’m sure it would get me fired…. Great.. now My monitor can be EMO too.. its bad enough with the kids running around.. i wonder if it can write self loathing poetry..